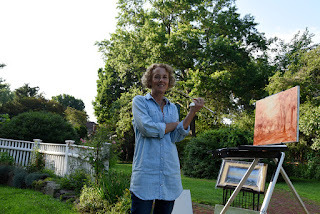 Northampton, MA—“En plein air” is a French term referring to the act of painting outdoors with natural subjects and light. On Friday, July 8, ten notable local artists will showcase their skills al fresco throughout the late afternoon and evening as part of what is becoming an annual festival for downtown Northampton--Arts Night Out En Plein Air. This is a free and interactive event during which participating artists welcome onlookers to watch them work and engage in conversation about the technique. The artists will be clustered in a variety of locations along the regular Arts Night Out gallery walk route. Jeffrey Gatrall, Kathleen Hession and Elizabeth Lehman are stationed at Forbes Library. Susan Barocas, David Brewster, and Robert Markey can be found in front of Memorial Hall. Paula Gottlieb, Frank Gregory, and Scott Prior are setting up on the lawn in front of the Old Courthouse. Elizabeth Stone will be painting portraits of near the steps of City Hall. The public is also invited to take part in the festival by borrowing one of 20 plein air watercolor kits. Materials, courtesy of Chartpak, will be distributed, and demonstrations will take place in front of First Churches at 129 Main Street. Kathleen Hession at Historic Northampton during Arts Night Out En Plein Air in 2015. Photo credit Ellen Augarten.